A myth is a widely held but false belief or idea. Mutual Funds have given rise to many myths. 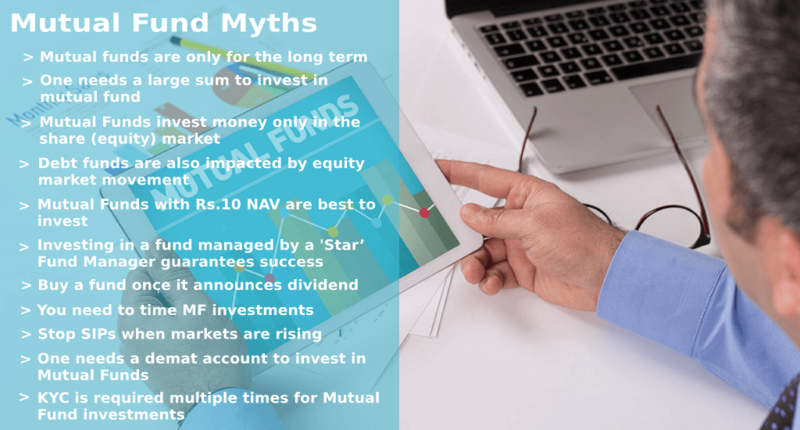 These myths habitually give rise to undue fears and concerns in the mind of investors and keep them away from fully realizing the benefits of Mutual Funds. We are trying to break wrong notions generally associated with investments in mutual funds through this blog. Using simple language and anecdotes from daily life, Afinoz has enlightened investors about the true facts of mutual fund investments. We hope this will help clear your doubts and misconceptions about mutual funds and make you an informed investor. Afinoz, India’s finest investment service provider portal, which will help you understand the basics of financial planning and guide you on your path to meeting your financial goals. Our objective is to make you aware and informed so that you make the right investment decision. Mutual funds are useful for every investment purpose, be it short term, medium term or long term. While Liquid and Short-term Debt funds are suitable for short and medium-term requirements, Equity funds are ideal for long-term needs. So if you are planning to save money to celebrate your anniversary next year, you may opt for Liquid or Short Term Debt Funds, but if you are building a corpus for retirement, Equity funds will be more suitable. There is a common notion among a large section of investors that they need a huge amount of money to invest in mutual funds. In reality, it is just the opposite and one can invest as low as Rs. 500 per month via Systematic Investment Plan (SIP) and Rs. 5,000 through lump sum mode. What’s more, there is no monthly or annual maintenance charge even if you don’t transact further. Just like the batsmen reached the huge target by taking short runs regularly, you too will be able to meet your financial goals by investing a small amount regularly over a long period of time. There are various types of mutual funds available in the market which caters to individuals having different risk appetite. So if you are a risk-averse investor, you may opt for a debt fund which invests in Government Securities, Bonds and other fixed income instruments. There are even mutual funds that invest in gold. All mutual funds do not invest in equity markets and you can choose a fund keeping in mind your risk appetite and financial goal. Just like neurological illness and heart ailments have no connection and require different medical expertise, similarly events in the equity markets are unlikely to impact the performance of a debt fund. Debt funds and equity funds invest in separate set of instruments and have a completely different portfolio and fund management strategy. Thus investors who want to avoid the volatility of equity markets and have a shorter time frame to achieve their financial goal may opt for less risky debt funds. There is a common misconception among investors that a scheme with NAV (Net Asset Value) of Rs.10 is cheaper than another scheme with NAV of Rs. 100. If we assume that an NFO (New Fund Offer) maintains similar portfolio as that of an existing scheme with NAV of Rs. 100, the returns would be same irrespective of the NAV. So instead of concentrating on a “low” NAV and more number of units, it is worthwhile to consider other factors before investing like the performance track record, fund management and volatility that determine the portfolio return. No one can predict market performance. A 'Star' fund manager who has delivered high performance in the past may not always do so in the future. Same is also true of 'Star' Fund Houses. Therefore, when investing, don't blindly follow star fund managers, but select a fund that meets your investment objective and risk appetite. Just like a movie starring a super star cannot guarantee success at the box of fice, similarly a star fund manager or a star fund house cannot always guarantee good returns. A fund’s performance is evaluated by the movement of its NAV and not on the amount of dividend paid. Dividends are paid out of accumulated and realized profit of the fund. Under the dividend payout option, the profit made by the fund is distributed among investors, while in case of a growth option; the profit is retained in the form of a higher NAV. Thus, an intelligent investor never times a purchase in any mutual fund based on declaration of dividend. There is no alternative to hard work and discipline in life and mutual fund investments are no exception. Just like regular and sincere work pays off in real life, a similar approach in mutual fund investments is also desirable to achieve financial goals. Market movements are unpredictable and one should not try to time investments. Rather, stay focused on your financial goals by investing regularly and success will follow. Just like the total course of a medicine needs to be completed to get fully cured, similarly your SIP must be continued throughout its term to achieve the desired financial target. Rather than trying to time the market, you should invest regularly to reap the benefits of rupee-cost averaging. If you have a long-term investment perspective, short-term fluctuation in markets should not alter your plan to meet your financial goals. Mutual Fund investors are free to receive the units either as a physical statement or dematerialized form. So, it is not mandatory to have a demat account for investing in mutual funds. If you are a first-time investor in mutual funds, you need to fill up a Know Your Client (KYC) form and submit it along with your application form and relevant supporting documents. Once your KYC documents are verified, your investment will be accepted. KYC (Know Your Customer) is just a one-time exercise and the process can be completed through a SEBI- registered intermediary (broker, Depository Participants (DP), mutual funds, etc). You need not undergo the same process again while approaching another intermediary. As per the KYC requirement, you need to submit an identity proof, address proof and latest photograph to invest/transact in mutual funds/securities markets. KYC is mandatory to invest in mutual funds. Just like a combo ticket to an entertainment park makes it easy to enjoy all the rides, doing KYC one-time allows you to invest in all mutual funds hassle free.